Monday.com is the new name of a product previously known as dapulse, namely one of the market’s leading collaboration and communication apps for teams. It syncs all information in a single, accessible hub, and empowers agents and team members to make important decisions together. Thanks to its compactness, Monday.com is the leading solution in our project management software category, and winner of our Supreme Software, Expert’s Choice, and Great User Experience Award. Monday’s key field of action is streamlining contribution, and helping teams and departments perform in the best possible way. Another thing to be appreciated about Monday.com is how it assembles and displays progress data in a logical and understandable manner, making it possible for all team members to keep track of projects and common operations. Meanwhile, Monday.com makes sure they will have the necessary incentives to contribute to tasks and assignments, even if those are not directly connected to their role in the company. As an end user of this platform, you will also enjoy a neat, well-organized, and collaboration-first interface, that reminds in many occasions of our profiles on favorite social networks, and our common methods of interaction. Regardless of whether you’ve used a similar app before, Monday.com can be embraced with no training or preparation. Yet, the company packed and offered a number of training materials for novice users which you can find on their website or YouTube channel. What is often considered to be Monday’s most distinctive advantage compared to similar systems is the advanced scheduling capability, which applies both to task and project management, and helps companies get rid of arcane paperwork. At the same time, it is this capability that makes sure there will be no manual entry errors, and which makes the brand even more trustworthy and reliable in the eyes of prospective buyers. Satisfied users, for instance, put forward timely delivery, claiming that Monday.com deserves a closer look, and so do our experts. FinancesOnline appreciates foremost the speed and responsiveness of this system, and the unique combination of project and activity management with collaboration features. All team members are assembled on a single board, promptly notified and alerted, and enabled to store all relevant discussions in a searchable database. To make matters even better, Monday.com is well-connected with leading apps of its kind, reasonably priced (prices start at $25/month), and equipped with powerful searching capabilities and unlimited storage. As your business grows and expands, Monday.com will make it painless to shift to a premium version (Standard, Pro, or Enterprise), and acquire some of the platform’s premium features, VIP priority support, impeccable security, and hands-free maintenance. For those who would like to give the platform a test-drive prior to their purchase, there is a free trial available. Monday.com has many unique capabilities that can boost the performance of any business, and highlights that make it a preferable alternative compared to similar platforms. The inheritor of daPulse’s amazing success in the industry still counts as the most transparent PM & collaboration system, whose development team managed to assemble many important features in a compact, yet easy to use package. From your very first encounter with Monday’s private and shared boards, you will be convinced that you couldn’t have made a better choice for your business. Monday.com uses a unique Board concept, which means it provides in-depth insights on your projects or tasks, or even the complete company’s performance upon need. There is the main Board that lists all projects and tasks together, connects them to the team members in charge (or other parties interested to track the process). An interested party can even be external partners or project beneficiaries that don’t have a Monday.com account, but will nevertheless be invited to follow with special alerts and notifications. They can be given a diverse suite of competences depending on their role, including the possibility to approve or dismiss a project without being permanent users of the system. Better yet, Monday.com makes it possible to monitor the performance of teams and individuals, and saves managers enough time to devote to more important operations. In former daPulse’s fashion, Monday.com remains extremely sensitive to customization, and lets the user configure almost any option until he gets a brand-specific platforms. The same way daPulse divided projects and tasks in Pulses (specific rows), Monday.com categorizes them in custom sections and groups, and abides to your specific rules and policies. Regardless of the number of changes you’ve implemented, Monday.com will remain in charge and follow each and every change, including modified dates and statuses, re-positioned agents, or fully dismissed actions. Basically, there is little chance something will go wrong and unnoticed, and even if it does, Monday.com will ‘know’ who caused it. Collaboration is where Monday.com shines the most, as all agents need to do to discuss or change an action is to click on it. This also means that collaborators are able to add comments on any updated, ask questions and trigger discussions, and take part of answering forum sessions. To make exchange of information even easier, Monday.com allows the uploading of different types of files and leaving notes; as well as following a live Facebook/Twitter activity feed that records discussions as they come along. Monday.com, the same as dapulse, has a reputation for being there for users at all occasions, rather than granting assistance to premium users only. It is almost as if you were becoming part of a large family, as agents will constantly share boards and issues, offer innovations, and make sure you’re optimizing the power of their system. Analytics and reporting are also well-executed, as Monday.com is able to collect and arithmetically relate connected projects and tasks, keep them organized in a historical spreadsheet, and enable users to find them easily upon need. At first sight, the history record may not look as the simplest or easiest-to-identify document, but its figures are clear, organized, and translate instantly to operable metrics. This spreadsheet will also be updated day by day, and its data will be exportable to third-party systems without any hassle. When it comes to integrations, there is little Monday.com can’t do in order to become part of an established software ecosystem. It is tightly connected to Dropbox, Zapier, Google Drive, and similar sharing and management tools, and also comes with open API architecture that lets developers build their own integrations. What Problems Will Monday.com Solve? 1. Keep everyone on the same page – Within a large company, all departments can set up a board to highlight their major goals and projects for the coming quarter. Everyone in the company can go there to see what the other departments are working on and what stage of the project they are up to. In addition, managers will have a go to place to see where things are at. If something is stuck in can easily be seen and by going into the individual line item (called a pulse) the manager can quickly message the person responsible. This also eliminates the need to call someone in for a meeting or having to find the person and ask them. More time for the manager to move to the next item on his to do list is the biggest plus of this system. 2. 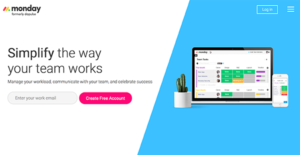 Easily work with freelancers and third parties – In a small company with many freelancers on board, dapulse helps create a board that they can choose whom they share it with. Other people in the company will not be able to see the board unless it has been shared with them. For example, if you are a designer working with a client, you can set up a board for his project, and permit him to follow the progress of his operation. The line item is in fact a complete design plan -once the designer has a completed plan, he can share it on the board. The client will get a notification that there is a new message from the designer. Then, he can open the board and review the plan, or even change a tile to indicate that he approves the plan or to request additional modifications. Highly customizable interface – You make T-shirts and have a very specific project workflow. You can create a board where the Columns are the different stages of the project. In addition you work with a number of people that are not located in your office, so each stage is related to a different team. So the first stage is DESIGN and second stage is MANUFACTURING while the Third stage is SHIPPED. So now you have set up a board for your unique process. Once the design is completed, they change the tile for that item to DONE. Now manufacturing knows that its their turn. They do their job and switch the tile to DONE. Now they are ready to Ship. Once shipped that Tile switches to DONE. It means that all of your communication and workflow aspects are collated under a single roof where all team members can monitor them while they are happening. Organizations have different wants and requirements and no software solution can be perfect in such a scenario. It is futile to try to find a perfect off-the-shelf software app that meets all your business needs. The intelligent thing to do would be to adapt the application for your unique needs, employee skill levels, budget, and other elements. For these reasons, do not rush and invest in well-publicized popular applications. Though these may be widely used, they may not be the ideal fit for your unique needs. Do your research, look into each short-listed system in detail, read a few Monday.com reviews, speak to the vendor for clarifications, and finally choose the app that offers what you require. We realize that when you make a decision to buy Collaboration Software it’s important not only to see how experts evaluate it in their reviews, but also to find out if the real people and companies that buy it are actually satisfied with the product. That’s why we’ve created our behavior-based Customer Satisfaction Algorithm™ that gathers customer reviews, comments and Monday.com reviews across a wide range of social media sites. The data is then presented in an easy to digest form showing how many people had positive and negative experience with Monday.com. With that information at hand you should be equipped to make an informed buying decision that you won’t regret. What are Monday.com pricing details? What integrations are available for Monday.com? Pros: Its UI is well-designed, simple and intuitive. The system is easy to understand and it’s straightforward but this doesn’t mean that you cannot streamline complex tasks. You can keep track of each project and everyone’s task and progress. Cons: It takes some time in order to understand how it works. They could make the option of creating subtasks more simpler. Additionally, it would be great if I cna use it for personal purposes. If you need more information about Monday.com or you simply have a question let us know what you need and we’ll forward your request directly to the vendor.